Why is one man an optimist, when another is a pessimist? Ernest Shackleton, the famed Antarctic explorer, is considered a good case study for how indefatigable a man can be. A co-worker recently shared with me his copy of the Kenneth Branagh-directed biopic Shackleton. I have read Shackleton’s Way: Leadership Lessons from the Great Antarctic Explorer, but it is interesting to see a dramatization of the 1914-17 trans-Arctic expedition that is often characterized as a great survival story. Shackleton, his crew of 27 men and their ship the Endurance never made it to the Antarctic. They were instead trapped in frozen waters, their boat was crushed by ice, and they had to survive on the ice or open water for two years before they were able to seek rescue. Every man made it back. The accounts of how Shackleton marshaled and rallied his men are inspiring, but I am just as intrigued by the accounts of Frank Hurley, the expedition’s official filmmaker and photographer. A veteran of an earlier expedition to the Antarctic led by Douglas Mawson, Hurley was hired by Shackleton to serve as his official documenter. 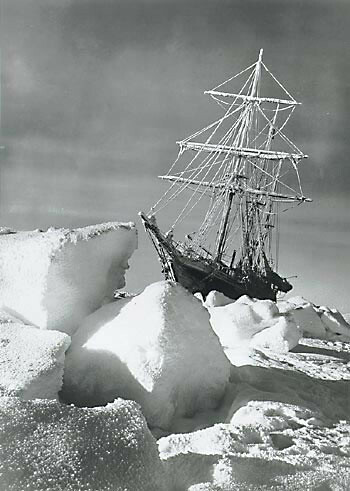 I want to get hold of the well-known Alfred Lansing account of the expedition, but I recently bought South with Endurance, the collection of Hurley’s stunning photographs from the trip. When the Endurance sailed in October 1914, Hurley carried a range of cameras, including a Cinematograph motion-picture camera, a square bellows stand plate camera, a Kodak Folding Pocket Camera Model 3A, and a Vest Pocket Kodak camera. The crew was astonished by the lengths to which he would go for an image, from high in the ship’s rigging to the back of a dogsled; First Officer Lionel Greenstreet called him a “warrior with a camera [who] would go anywhere or do anything to get a picture.” Hurley not only had the stamina to haul his cameras to the mountaintop of Duse Fell on South Georgia, but also was a talented artist and innovator. He was a pioneering practitioner of color photography with the Paget color process, and, when the long polar nights descended, he used multiple magnesium flares and long exposure times to capture images of the Endurance beset in darkness. After they abandoned the debilitated Endurance, Shackleton ordered the crew members to pare their personal possessions down to two pounds each. Hurley had to leave his precious cameras behind, but Shackleton allowed him to keep a selection of photographs and motion-picture footage. Stripped to the waist, Hurley dove into the icy waters to retrieve his treasured images from the sinking wreck of the ship. Together, Shackleton and Hurley chose 120 glass plates to keep and smashed about 400; Shackleton feared that Hurley would endanger himself to return for them later. Hurley sealed the plates in metal tins with improvised solder, along with prints he had developed on board the ship. Hurley documented the remainder of their odyssey with only a handheld Vest Pocket Kodak camera and three rolls of film. In paying homage to him, Kodak explained Hurley’s contribution to photography. Hurley raised expedition photography to a new level. He did not make routine photos of explorers posing in the snow. Instead, he often focused on the snow itself, or on grim snowscapes that became beautiful in his compositions. These scenic studies he integrated into the documentation of the expedition. Update: Michael Ybarra reviews Stephanie Barczewski’s new book Antarctic Destinies, which puzzles over what makes some men heroes, others failures.